In light of the ugly debate to the south, this seemed appropriate. Taken at the Aya Sofia museum in Istanbul. First built around 500 AD, this Christian cathedral served as the central basilica of Constantinople. Following the Ottoman conquest in 1453, the new rulers recognized the value and beauty of this place and converted it into a mosque. Centuries later, in the 1930s, Turkey’s beloved Mustafa Kemal Atatürk declared that the mosque would be secularized and converted into a museum. 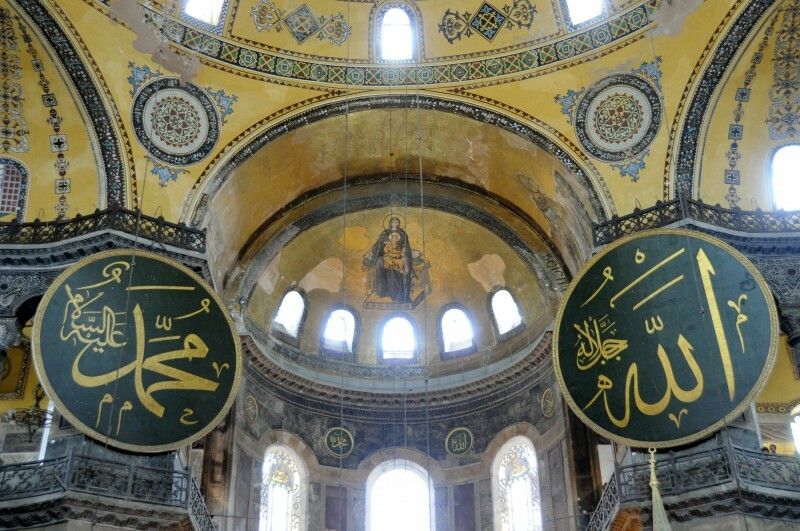 Christian mosaics (such as Mary and Jesus centred) that had been covered would be revealed alongside golden Islamic medallions honouring Allah and Muhammed. Essentially, the place would become a shrine to the country’s past – both Christian and Muslim, side-by-side. Chronicles of My Asian Adventure Sara’s blog of our trip. Tasty and Frightening – Food Photos!